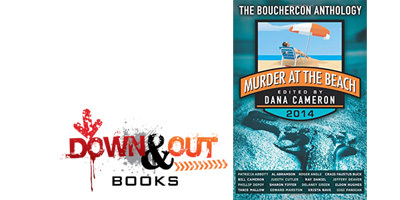 Lutz FL, November 12, 2014: Down & Out Books, a leading independent publisher of noir and crime fiction, is pleased to announce the publication of Murder at the Beach: Bouchercon Anthology 2014, edited by Dana Cameron. This year, Bouchercon — which is being held November 13-16 at the Long Beach Hyatt Regency — celebrates a return to the California beach with an anthology of short stories by a roster of talented writers. You’ll never think of sun, sand, or picnics the same way again. “We are thrilled to have been selected by Boucheron to publish this anthology,” said Eric Campbell, Publisher, Down & Out Books. “With the remarkable Dana Cameron as editor and an outstanding group of authors contributing, Murder at the Beach: Bouchercon Anthology 2014 is a fine collection of stories that reflects the importance of Bouchercon to the mystery genre.” Campbell added that all proceeds from the sale of the book will be donated to the Long Beach Public Library Foundation. Murder at the Beach: Bouchercon Anthology 2014 (Down & Out Books; $15.95 trade paperback) is now available at bookstores and online retailers. Signed copies of the book may be purchased at the Down & Out Books table at Bouchercon. For more information, contact Christy Campbell, christy@downandoutbooks.com.